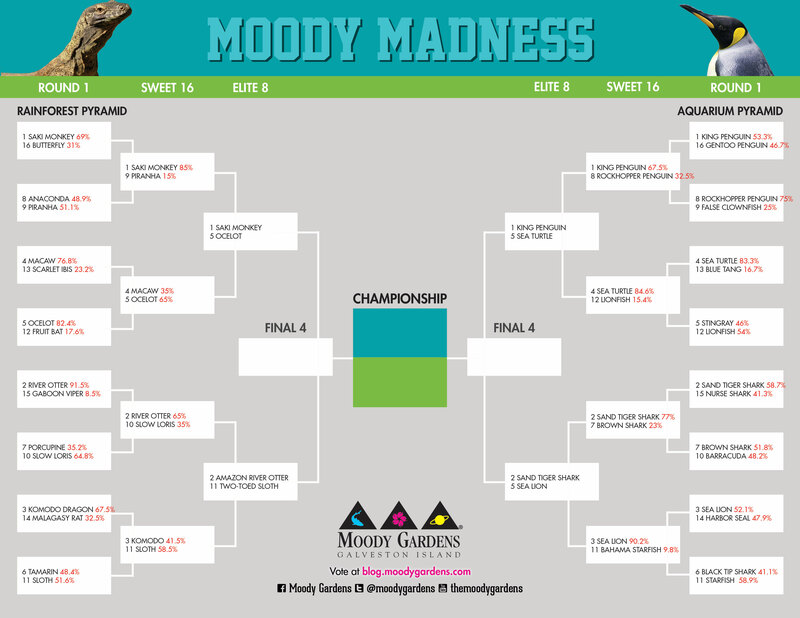 The Sweet Sixteen of the Moody Madness tournament saw most of the top seeds move on, with the exception of two upsets. The Cinderella story of the tournament to determine the most popular animal at Moody Gardens continues to be the Two-Toed Sloth. After a surprise win over the Cotton-Top Tamarin, the Sloth pulled out a stunning victory over the Komodo Dragon. Can the Sloth continue its improbably run against the Giant River Otter? Can the top-seeded White-faced Saki Monkey and King Penguin continue their march to the Final Four? That’s up to you to decide. CLICK HERE to vote or vote below for your favorites!